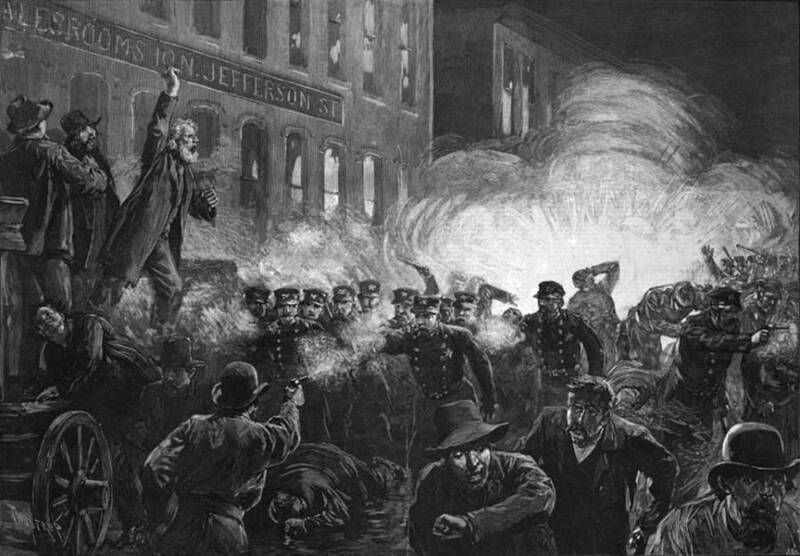 An illustration of demonstrators clashing with police during the Haymarket Riot in Chicago on May 4, 1886. ''No single event has influenced the history of labor in Illinois, the United States, and even the world, more than the Chicago Haymarket Affair,” according to historian William J. Adelman. It started with a stick of dynamite flying through the air during a rally in Chicago’s Haymarket Square on May 4, 1886. And that one explosion set off a chain of events that turned six anarchists into martyrs, brought on America’s first “Red Scare,” turned May Day into an international holiday, and gave the United States an eight-hour workday. It’s not a story you usually learn in history class, but it’s one that affects you every day. The Chicago Haymarket Riot is the story of how workers in America finally won their rights. 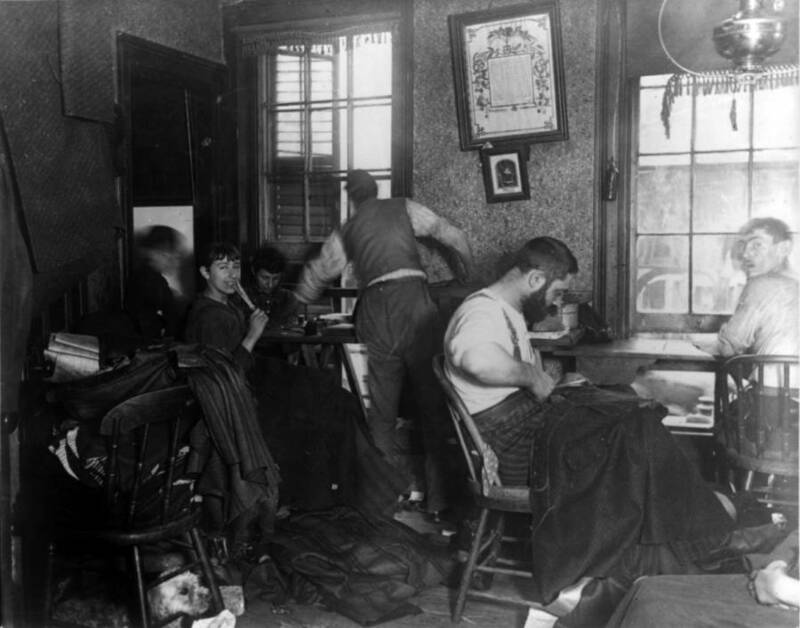 Laborers toil inside a New York sweatshop. Circa 1880s. The decades surrounding the Haymarket Riot was the era of American sweatshops, child labor, and brutal factory conditions. At the time of the Haymarket Riot, Chicago employed tens of thousands of immigrants in factories, most working 60 hours a week for about $1.50 a day. Thus the city became the center of a revolution. While labor unions across the country were striking and protesting for better conditions and shorter hours, rallying around the call of “Eight-hour day with no cut in pay!,” Chicago became a particularly intense labor battleground. By some counts, half a million men were on strike across the United States in the time of the Haymarket riot, with 30,000-40,000 on strike in Chicago alone. All that came to a head on May 3, 1886. Employees on strike at Chicago’s McCormick Harvesting Machine Company plant rushed out to confront some strikebreakers – workers sent in by the company to take their jobs – causing the police to open fire on the workers, killing two and wounding others. The city was then at a fever pitch. Labor sympathizers were out for blood, and they were ready to spill it across the city. Thousands came out to the rally that would be the stage for the Haymarket Riot. Anarchist and communist leaders got up in front of the crowds and ranted about labor rights, unions, and the massacre at the McCormick plant while the police nervously looked on. The police moved in to shut it down 20 minutes into a speech by an anarchist named Sam Fielden. Up until then, police had stayed back – but Fielden, the officers believed, was calling for violence. As soon as the words left his mouth, though, something flew up in the air. It was long and red, and a slim of streak of fire traced the path behind it. It wasn’t until it landed with a thud at the policemen’s feet that they realized that it was a stick of dynamite. By then, it was already too late. A rendering of the explosion that set off the Haymarket Riot. The dynamite exploded, instantly killing the policemen in the front line. One, named Joseph Deegan, was thrown to the ground from the explosion. He struggled to get up to his feet, staggered a hundred feet, and then collapsed dead on the ground. The crowd ran for their lives. There was such a panic that people were trampled under the feet of the fleeing crowd. People ducked for cover inside of buildings and set up barricades of tables and chairs to stay safe. But those who were too slow were shot dead in the ensuing gunfire. There’s some debate about who fired the first shot. According to the police, someone in the crowd started shooting at them after the dynamite exploded; other witnesses, though, insist that the police simply panicked and started shooting blindly through the smoke. By the time the chaos of the Haymarket Riot had subsided, well over a hundred had been injured and 11 people were dead: seven police officers and four civilians. 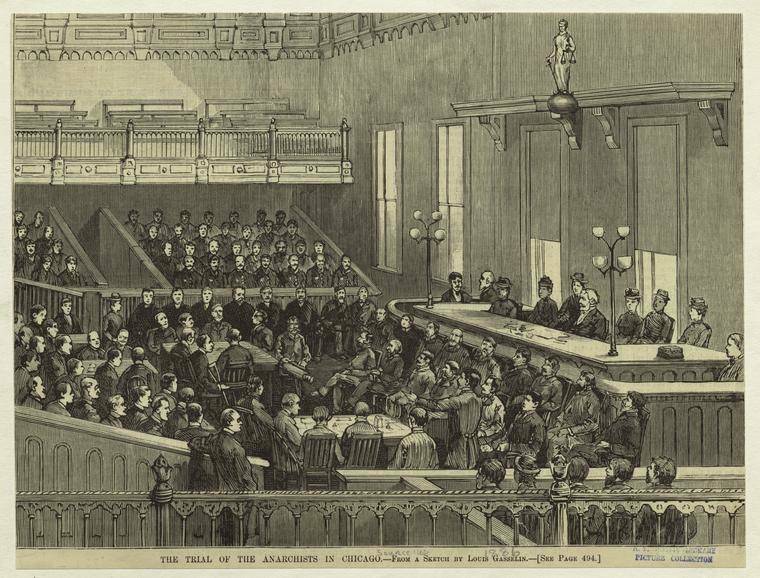 The trial of August Spies and other anarchists. The police had no idea who’d thrown the bomb, but that didn’t stop them from hauling people off en masse. Dozens were arrested the day of the Haymarket Riot, as were countless others in the months to come. The city struck down the need for search warrants and let the police ransack any building suspected to be involved with any anarchist or communist group. Eventually, eight men were put on trial for the explosion, almost all employees of August Spies’ Worker’s Times. The trial, though, quickly revealed that none of the men they’d arrested had actually thrown the bomb. Whoever had done it had gotten away with it. His words had little effect, however. The Haymarket Riot trial was rife with corruption – allegedly, the Chicago Tribune even offered to pay the jury money if they found the men guilty. And in the end, all eight men were found guilty, with all but one sentenced to death. 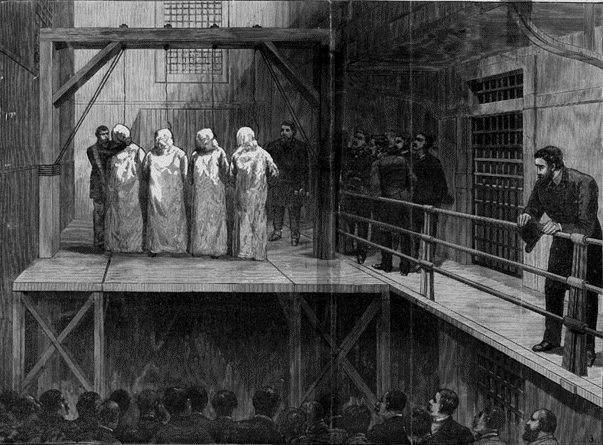 Four of the Chicago anarchists being hanged in Cook County Jail. 1888. He was right. The sham trial that sentenced seven innocent men to death became an international outrage, and Spies and his cohorts went from being seen as dangerous radicals to heroic martyrs. No one supported the man who’d thrown the bomb – but Spies and the men hanging from those gallows, the world agreed, didn’t deserve to die. 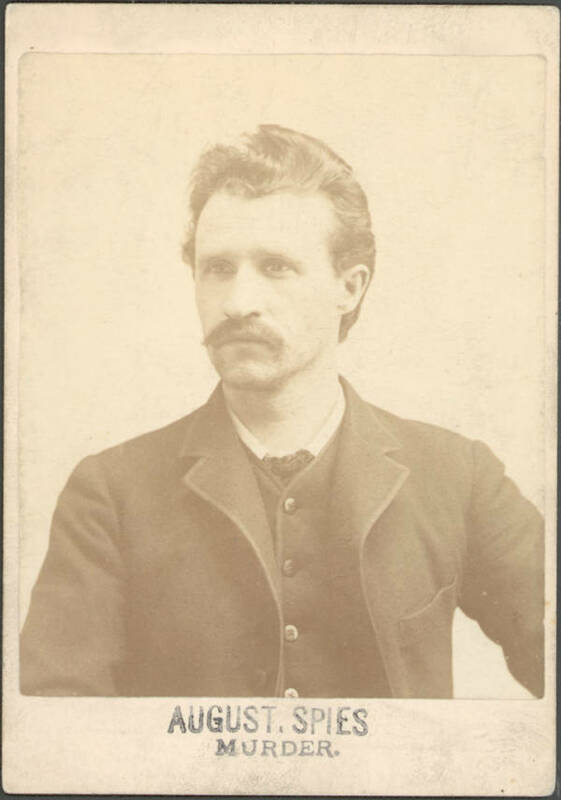 The Knights of Labor, a group campaigning for the eight-hour workday, soon doubled its membership, getting up to 700,000 followers within a few months of the Haymarket Riot. 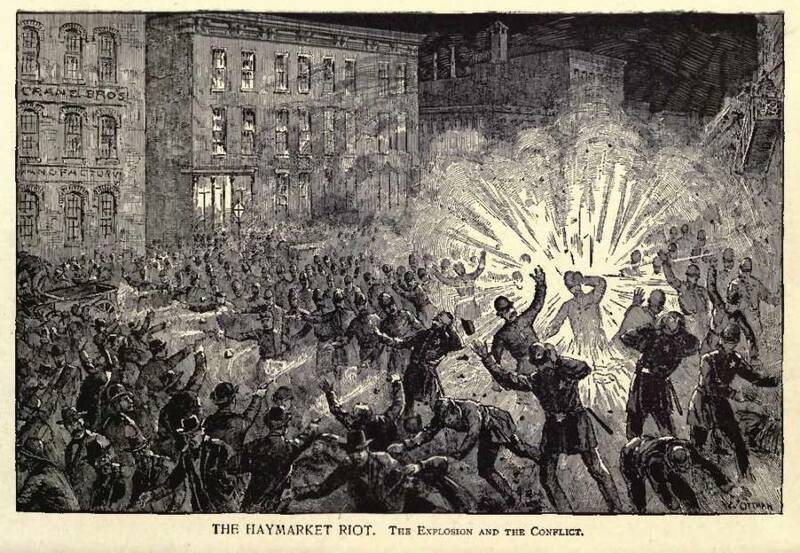 The American Federation of Labor introduced an annual international holiday commemorating the Haymarket Riot, to be held on May 1 of each year. The first one, in 1890, was celebrated with protests calling for an eight-hour workday in every corner of the world – and, to this day, “May Day” International Workers’ Day is still observed in countries around the world. In time, the dream of the Haymarket Riot demonstrators would become a reality. Thanks in part to the protests these men inspired, the eight-hour workday would become the standard around the world. The man who threw the bomb would never be caught. To this date, nobody knows for sure who did it – it may very well have been a disgruntled madman whose name has been lost to history. The bomb, though, didn’t change history on its own. It was the way the police handled it, by taking it out on the innocent, that invigorated the movement that gave laborers everywhere a better world to work in and changed history forever.